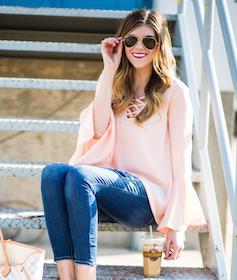 Off the shoulder tops have always been a favorite of mine! They are fun, flirty, show a little skin and just make a super fun outfit! This top from SheIn quickly became my favorite as soon as I took it out of the package. The black and white stripes and the button down detail…ah just obsessed! I knew it would look great with this high waisted split maxi skirt & wedges! I’m in love with this outfit! You can also check her out on Instagram! Thank you for SheIn for sponsoring today’s post! All thoughts, opinions & images are my own!